Disclaimer: Hayley Oliver-Smith is a columnist at the Daily. She was not involved in the writing or editing process for this article. For college students, as the newness of the community fades, students often forgo new relationships and experiences, gravitating towards the familiar. Student organizations like Open Call and TableTalk Tufts have formed to bridge the gaps between people. These two groups focus on finding common ground between individuals who might not initially seem to share much in common. Olive Baerde, a sophomore, started TableTalk at Tufts last year. Baerde was looking for a way to recreate the atmosphere of first-year orientation in an experience for all grades. “I realized that people are very friendly during orientation week and everyone wants to know new people, but once orientation week ended, they [started] forming their own friend [groups] and people are less likely to branch out,” Baerde said. Baerde started the group to extend friendships beyond the internet. “I realized how I have so many Facebook friends that I see every day on campus, but I never talk to them,” they said. 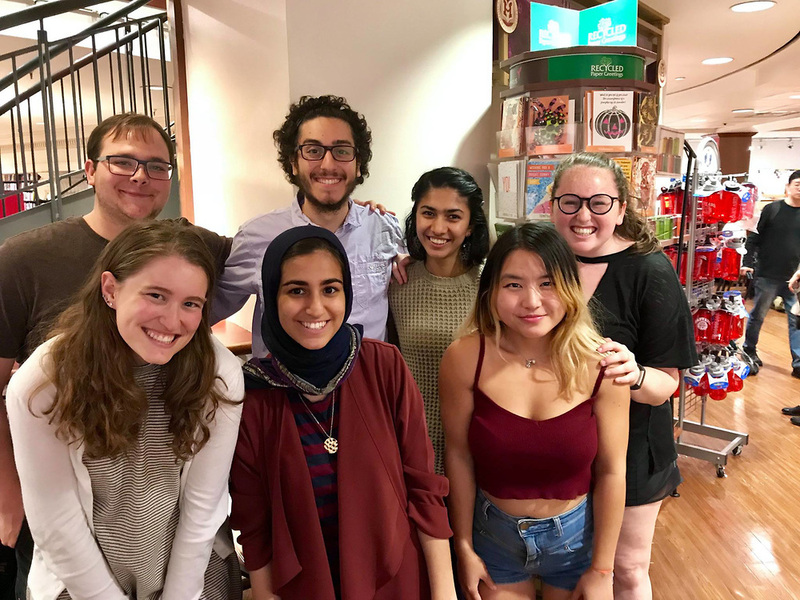 TableTalk’s University of Pennsylvania chapter website states that the organization provides an opportunity for Penn students to engage one another in meaningful and intentional conversation. Baerde is hoping to provide similar services at Tufts by way of a multi-pronged approach. Through three initiatives — Couch Talk, Group Talk and Table Acts — Baerde hopes to spark discussion among people who might not otherwise meet. According to Baerde, the Couch Talk initiative will allow people to sit down at a couch placed on the academic quad or Res Quad and have a spontaneous conversation with a stranger. TableTalk facilitators will also be present. Group Talk centers around a shared meal between larger student groups to facilitate conversations. “I feel that at Tufts there is lots of [conflict] between groups and many times those groups don’t talk to each other. They just talk to each other on Facebook or social media which just makes the conflict even worse,” Baerde said. For the final initiative, Table Acts, Baerde suggested posting questions at elevators or shuttle stops. These questions would be unique to each location. Open Call, another organization on campus, has a similar aim to TableTalk but uses a very different approach. Khuyen Bui (LA ’17), a founding member of the organization, explained what he has tried to accomplish with Open Call. “[Open Call is] an experiment in cultivating meaningful human connection through shared novel experiences,” he said. Bui said that the group’s foundation was prompted by the divisive atmosphere during the presidential election last November, explaining that he saw division at Tufts as well as in the United States at large. He said he founded the group in an effort to bring people together. Since November of last year, Open Call has hosted events almost every week. The largest group, Bui said, was about 40 people. He also said that about one third to one half of each event consists of newcomers. Most new people come to an event because someone they knew attended one previously, he added. Open Call recently hosted an event at the Mayer Campus Center to showcase their unique experiences and to raise awareness. “We had a sale booth at the Campus Center and we had a menu of experiences. Like get a massage without hands, or have an interesting conversation or stare at someone. My favorite one is getting baptized without water,” Bui said. Bui said that, instead of charging money for these novel experiences, he charged Facebook likes. This semester, she has been at Open Call every week along with a core group of about six or seven other students. According to Oliver-Smith, she has transitioned into more of a leadership role and works to increase the outreach of the group, despite the group’s lack of formal leadership or hierarchy. For the group’s future, Oliver-Smith hopes to have Open Call be a Tufts Community Union (TCU) Senate-recognized organization by next semester. For now, she hopes to continue the unique space Open Call creates for students each week. There will always be different ways that people will interact, get to know one another and make friends. According to Baerde, even the most mundane act could be a chance to make a new friend. “People always sit by themselves when they get on [the] Joey, but that 10-minute ride may be 10 minutes of meeting a new person,” Baerde said. UPDATE: This article has been updated to avoid ambiguity surrounding when TableTalk was founded.